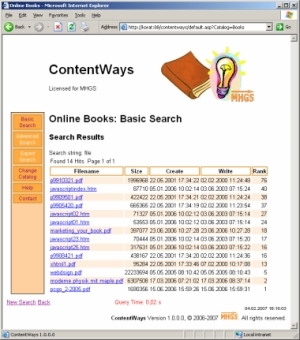 ContentWays is a Document Search System for low-cost information retrieval. are based on the Indexing Service, which is available since Windows 2000 or later. ContentWays Local and ContentWays Web are currently not maintained. Please see ContentWays SE which is based on Windows Search. Please note that ContentWays Web is supported only by special arrangement with existing customers. More Information about ContentWays Local and Web is still available as PDF Document.